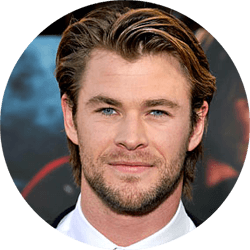 Chris Hemsworth was born in Australia though he also spent much of his youth in the small Aboriginal town, Bulman. His brothers, Luke (older) and Liam (younger), are also actors. In 2004, Hemsworth got his start in acting with the role of Tim Hyde in the Australian soap opera Home and Away. He is best known for his role in the Marvel Comics movie Thor (2011). He also starred as Thor in The Avengers (2012) as one of the six super heros who protected earth from his brother Loki.